Hey there, ReadyNutrition Guys and Gals! Today we’re going to give a few pointers to possibly an overlooked resource for your survival right under your fingertips. You guessed it: the pine tree. 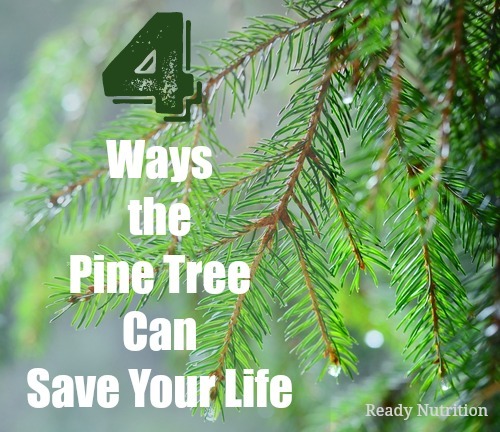 There are many benefits that pine trees offer for the survival enthusiast. They can be found virtually in any part of the country; therefore, it will benefit you to explore the resources of this bountiful plant. Pine needle tea alone contains more than 5 times the amount of vitamin C in an orange. The way to prepare it is as follows. Take your pine needles (a good, full handful) and cut up the needles until you have a bunch of pieces about ½ inch in length. Then macerate them (chop them up). Add them to boiling water, and boil for about 3 minutes. Then take them off the burner, keeping the pot covered and allow them to steep for a good 15 to 20 minutes or until cool. One cup of it is enough to maintain the RDA for Vitamin C in an adult. This holds true for all of the pines, however, there are 6 species that must be mentioned for toxic effects. Avoid these for any kind of food use: Norfolk Island Pine, Ponderosa Pine, Monterey Cypress, Lodge pole Pine, Common Juniper, and Yew. Pine nuts can be gathered from pine cones between September and November. They are rich in Vitamin E, pinolenic acid (an omega-6 fatty acid), and oleic acid (a monounsaturated fat that lowers LDL (the bad cholesterol, Low-density Lipoprotein). Pine nuts are chock full of essential minerals such as manganese, potassium, calcium, iron, magnesium, zinc, and selenium. The nuts also provide the B-complex group of vitamins such as thiamin, riboflavin, niacin, pantothenic acid, vitamin B-6 (pyridoxine) and folates. From a nutritional perspective, it can also be said that the pine tree can provide for some of your needs in a survival situation. There is a layer beneath the bark called the cambium layer. This is a layer that the tree stores all of its energy, similar to the way other plants store theirs in bulbs, roots, etc. When you extract this cambium layer, you can obtain the carbohydrates by cutting pieces of it up into strips and chewing them. Don’t eat them! The fiber will pass through you akin to a lawn mower in Stephen King’s movie “Maximum Overdrive,” thereby defeating the positive gains you may realize. Chew on those strips and allow the carbohydrates to be softened and absorbed as you such on the plant fibers. It tastes terrible: akin to turpentine. Then again, this is survival, and you don’t have the luxury of choice in certain circumstances. The thing that makes the pine so good a resource is that it is a perennial and an evergreen: it can be used in these outlined capacities all year round. Here is a link you may find interesting that has several films on various uses of pine sap (resin). Pine boughs are excellent material for bedding. When layered properly, they will lock the cold out and keep your heat from being transferred into the ground (conduction). You can also thatch the top/roof of a lean-to that will enable you to keep drier. See video here. This is due to the semi-waxy coating on the outside of the leaves (the needles) that help in terms of water resistance. Fire is life in a survival situation and pine wood is an excellent source for fires. Specifically, older pine needles make excellent fire starting material, as well as the older pine cones. Fatwood is another bi-product from the resourceful pine tree. You can find high quality fatwood in forests or in your own backyard that will help to start your fire more quickly. You can also collect the sticky resin from pine trees to use to start a fire – all you need is a dime-sized amount. Pine stumps are an excellent source to look for fatwood and resin. As well, the resin can be used as a waterproofing agent to patch up tent seams, boots and mittens. Incidentally, I almost forgot…the tea I outlined above? You can also bottle it up and use it as an astringent for minor cuts, wounds, abrasions, and rashes. Pines are habitats for many different forms of wildlife, such as birds and squirrels. In a survival situation, it would behoove you to study what pines the birds and squirrels prefer in your locality. The pine tree can be a very valuable resource for you: for food, shelter, fire and medicine. Be sure to mind the local laws and ordinances before you practice some of these techniques. I highly recommend (if you have a Christmas tree) trying it with some of the needles, and experimenting with a tea for yourself, prior to discarding the tree this season. Have a great day! For the tea, don’t boil the water it will cause the vit c to break down. The sap/resins are anti bacterial along with having drawing properties (removing stingers from your skin) the bark on the limbs can be used as wound coverings cut off a portion both inner and out bark. That by it self should be sticky enough to aheare if not add some reasin. Good for smaller cuts and scrapes to help prevent infection. The resin can also be used when making soaps in the bush. ( render tallow and make lye from the wood ash) adding the resin gives the soap an antibaterial propertie. You can also make pitch, used to glue stuff together. It reqire charcoal and a binding agent cat tail fluff works well. Maybe worth the time if your shoes start falling apart from walking. As far as cooking don’t use pine if your cooking meat directly over the fire it’ll give it a bad flavor, start your fire with pine but cook with a less resionous wood. Won’t matter if your boiling your food since there won’t be contact with the smoke/flames. Some of this may not good practice for a 72 hour type survival situation but good stuff for long term. Good comments. All very useful and valuable info. There are a few others here that I will research (tree-wise) for a future article. Black spruce is actually a cure-all for just about any ailment. There are some other “goodies” floating around. I was trying (with the pine) to focus on perennial evergreens, since this time of the year everything else is mostly dormant. I promise you one on the trees (we’ll focus on the stuff for wintertime, first), and in the spring we’ll do some more. With your permission, I’ll dedicate the article to you. You have a good day, and thanks for the information. Walnut is also a vertile tree as well as willow for it pain relieving properties. Now there’s some useful information, thanks JJ. i have been reading about health benefits from 100% pure gum spirits of turpentine. i spoke to a very intelligent man who swears he cured himself of lymphatic cancer 10 years ago by following the turpentine protocal. sounds crazy but i will be open minded to research any leads.